Posted February 14, 2014 by Ciaran Tierney, The Connacht Tribune in News. 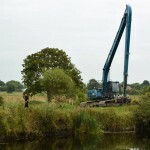 A long awaited river drainage scheme which is set to alleviate flooding in the Claregalway area has been given the go-ahead by the Government, with work set to be carried out this year. The Minister of State with responsibility for the Office of Public Works (OPW), Brian Hayes TD, has confirmed that funding has been put in place for the River Clare scheme. Confirmation that the project is set to go ahead this year will come as good news to dozens of householders whose homes were flooded in November 2009. The project will include the deepening of the channel at the new bridge in Claregalway village, maintenance of the channel downstream from the Curraghline (N84), and the extension of an island drain to relieve regular flooding in Carnmore. It will involve the installation of a one-way valve to prevent water from packing up in times of heavy rainfall or flooding. 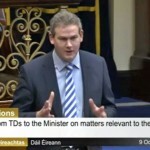 While a new bridge has already been put in place at Claregalway, Deputy Sean Kyne (Fine Gael) said this week that the commencement of the drainage scheme would provide long-term assurance to householders. Deputy Kyne said the recent storm damage in Co. Galway had revived memories of the devastation caused to families in the Claregalway area just over four years ago. “Last year Minister Hayes visited the area with local councillors Peter Feeney (FG) and Malachy Noone (FF)and the OPW officials and saw for himself the extent of the works already carried out but also the level of works still required to prevent further flooding,” said Deputy Kyne. “The OPW will shortly commence a tendering process to select suitable companies so that the vital work can get underway,” concluded Deputy Kyne. In November 2009, houses in the Claregalway and Cregmore areas were submerged in several feet of water when the Clare River burst its banks in several locations. Residents were forced to abandon 13 houses in the Caherlea and Lisheenavalla villages, near Cregmore, due to extensive damage from the river water. A firm of consultants was subsequently engaged to carry out a study on the flooding along the River Clare almost four years ago.